The new movie Devil’s Due opens in theaters this weekend and reviews have been fairly negative from general film go-ers (36% on the Tomatometer) and fairly positive from the horror websites Bloody Disgusting, Dread Central and FearNet. On the plus side it’s from an indie filmmaking duo called Radio Silence who directed my favorite segment (“10/31/98”) of V/H/S. On the negative side, it’s a found footage movie, an overused gimmick that is limiting narratively and mostly unbelievable in practice. As part of their marketing plan, the studio put out two attention-getting publicity stunts. Over the last week they released a hilarious prank video featuring a runaway baby stroller which must be seen. This was definitely marketing at it’s best since it captured so many views already, and pranks like these are always fun to watch. Everyone loves a good startle scare! 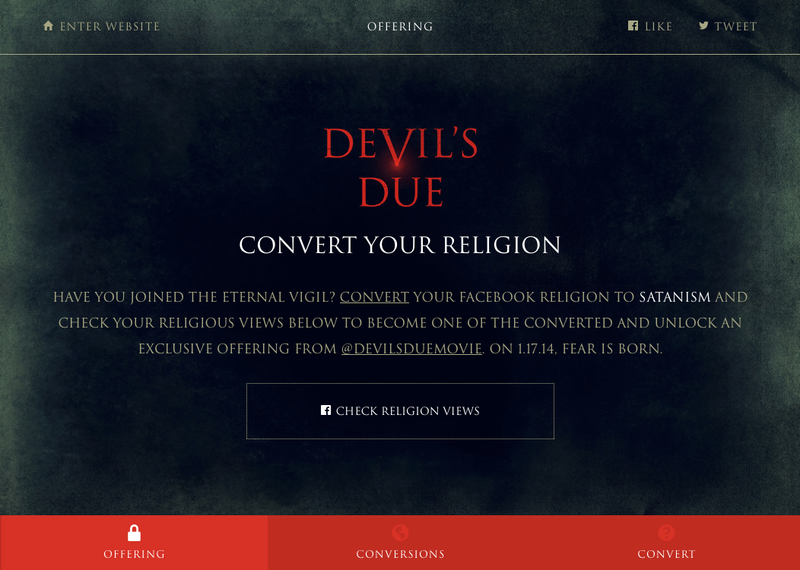 On a more questionable note, the Devil’s Due website features a “special offer” to visitors. All you have to do is convert to satanism on your Facebook page. There’s fun and scary, then there’s crossing the line into the extreme and off-putting. I love horror movies but I was also raised with a belief system. Even as a publicity gimmick, this marketing angle is somewhat repellent and distasteful. You are messing with people’s belief systems in a very social way and everyone has family and coworkers on Facebook. Do you really want to announce to mom that you now pray to the hoofed one because you had to see a 20-second clip on a website? Maybe kids who don’t ever consider the long-term consequences of social media might find it funny and subversive, but really it’s just unpleasant and ruins the fun of a horror movie.